Hino SA has added five more derivatives to its already comprehensive range of 300-Series medium commercial vehicles as a response to customer requirements. The range has now grown from 8 to 13 variants, providing an extremely comprehensive product line-up in the local MCV market. “The Hino 300 and its Toyota Dyna predecessors have been among the most popular ranges of MCVs locally since the arrival of Dyna in South Africa in 1965,” explained Ernie Trautmann, the Vice President of Hino SA. “However, over the decades there has been growing sophistication in this market, resulting in the demand for more derivatives to cater for specific customer needs. Recently these requirements have included an increasing number of requests for more models with automatic transmission and crew cab bodies which were first introduced on the new Hino 300 range when it was launched here in 2013. Two more models – the 614 and 714 SWB – are now offered with Hino’s six-speed A860E fully automatic transmission which is already fitted to the Hino 300 815 automatic models and has the fifth and sixth gears as overdrive ratios for improved fuel economy. Automatic transmission is important in cutting driver fatigue while also reducing maintenance costs as there are no more replacements of clutch components. In addition, a crew cab is introduced on 714 and 915 manual transmission variants, while the wheelbase of the 815 automatic transmission model has had its wheelbase shortened in reaction to feedback from customers and Hino dealers. The Hino 300 range now offers an ideal transport solution for urban, inter-city and regional deliveries with an approximate body and payload allowance of between 3 390 – 5 950kg. 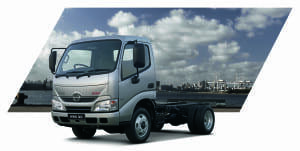 The Hino 300 was designed with the driver very much in mind. Large door opening with big footsteps make entry and egress easy, while the cab is spacious, with plenty of headroom, legroom and in-cab storage. The driver’s seat is fitted on an inclined rail and is adjustable to accommodate people between 147cm and 203cm in height. The dashboard has easily legible dials with a multi-function display, while all the hand controls have been ergonomically designed for convenience and ease of use. Creature comforts for the occupants include standard fitment of air conditioning, an audio system and electric windows, while a foldable gear lever enhances freedom of movement around the cab when the truck is stationary. There is also air conditioning and additional bottle holders in the rear section of the crew cab which can accommodate four occupants. Safety and security also had a high priority in the design of the Hino 300 and safety features include anti-skid ABS brakes, seat belt pre-tensioners, side impact beams and driver and passenger air bags. There is a seatbelt warning light and buzzer to ensure the seatbelts are used. A large windscreen, large side windows and narrow “A” posts ensure excellent visibility for the driver. A transponder key-operated ignition and central locking system is an important standard security feature as is microdot vehicle identification. All the Hino 300 models are powered by the four-litre N04C Hino four-cylinder turbo intercooled diesel engine in varying stages of tune which provides outputs of either 100kW of power and 392N.m of torque or 110kW of power and 420N.m of torque. The engine is mated to either a Hino M550 five-speed or MYY6S six-speed manual transmission or the six-speed A860E automatic transmission. Drive to the rear wheels goes through a full floating single reduction hypoid rear axle with ratios to provide optimum performance and fuel economy for each model. Hino’s long history of quality, durability and reliability in the South African truck market is well known for providing customers with peace of mind while the trucks are further backed by a raft of value-added Hino-Care services, including an unlimited kilometre/24-month warranty, 20 000km service intervals (dependent on operating conditions), towing assistance and 24-hour roadside assistance while financial packages as well as maintenance and service plans can be tailor-made to suit customer or operational requirements. An impressive resale value attributed to the Hino brand is also a testament of its promise to providing the reliability one would expect from this brand. Importantly, Hino has one of the largest footprints of any commercial vehicle brand in SA with 65 dealers countrywide, 21 of them exclusive truck dealers. In addition Hino continues to fare very well in the regular Scott Byers Comparative Customer Satisfaction surveys which measure a brand’s performance in the key areas of sales, parts and service. In fact Hino has maintained the overall number one position over the last three quarters since October 2014. “We are very pleased that the new additions to the Hino 300 range will make us even more competitive in the keenly-contested medium commercial vehicle market in South Africa and the enlarged range emphasise the importance we place on customer and dealer feedback while our customers continue to benefit from our strategy of continuous improvement,” commented Ernie Trautmann.